Last Friday I visited the studio of Deutsche Welle in Bonn. That is the German international Broadcasting. I was invited for an interview on the issue of body language and nonverbal communication, concerning the difference between Germany and China. I was asked general questions on the issue and very specific questions on the difference of behavior of Angela Merkel und Wen Jiabao. While waiting at the Chinese editor`s office ………for the start of the interview I found two written pages which I want to show to you. The two pages mirror an issue in the editor`s team which is quite relevant at the moment. The journalists obviously are engaged in relating to the meaning of feeling (s). Are they important? What is it all about? Are feelings elusive? 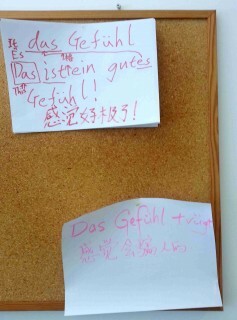 I really was astonished about this issue in a Chinese editor`s office. To be honest I did not expect this issue being posted in public there. I can imagine that Chinese know about feelings, that they of course feel like other people. But to be engaged in this issue in public????? How could this happen, I asked myself. I also was astonished about the specific second paper ( are feelings elusive?). I asked myself why is this question so important to be posted there? Does it mirror some inner, personally or culturally important issue of Chinese people? And if so, how can such an issue be brought up into public so that it would not be too difficult to address to?